This past Friday Fun Challenge was issued by Jimmi Mayo. Her challenge was to use Rubber Romance stamps. I first saw Rubber Romance stamps on Etsy so I was familiar with them. Though I haven't gotten a chance to buy any yet, I do have a couple images from WishRak. I combined this challenge with this week's Featured Stamper, Cards by America. THIS is the card I tried to CASE. I really did what I could with this being that the image was just so big. I put some Black Diamond Stickles on her top to give it texture and glitter. But this image was SO easy to color because of all the detail and shading that was already on the image. I did VERY little. Awesome stamp! AWESOME CARD! This is so beautiful! Great coloring! Loving this image Ashley!!! Wonderful coloring, and I just love the girly you chose too!!! Love all the white as well. This is a great card!!!! You sound like you might be feeling better today???? I have a few friends who got sooo down during pregnancy they actually had to start taking Zoloft an antidepressant during pregnancy. They felt much better by the time the baby was about 3 months old. Hormones can do so wacko things to your body that is for sure. You might try pepermint tea it is supposed to have a good effect on your mood, and also there is somthing Arbond sells you can rub on your wrist and it helps with Prenatal, and Post Partum deppression, one of my friends gave it to me after I had my first baby and had a rough few weeks!!!! I will ask her what it is called tomorrow. Hope you are doing better!!! Wow!! What a classy card!! I love the stickles!! gorgeous Ashley! Love the stickles, perfect touch! Great layering too! Awesome job!! That's the really good thing about RR stamps, they're really easy to color!! 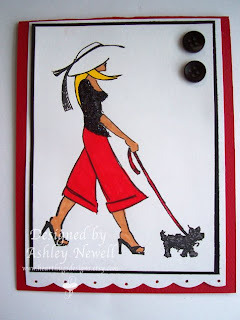 Oh my..what a gorgeous card, Ashley!! Thanks so much for playing along with our challenge!! Such a cute image... love your card.